I feel your pain, Cody. Oy, this has been a painful month. The BYU football team lost in rather spectacular fashion to Washington in the Fight Hunger Bowl, and the BYU basketball team has lost 4 games in a row for the first time in the Dave Rose era and finds itself in the bottom of the West Coast Conference. 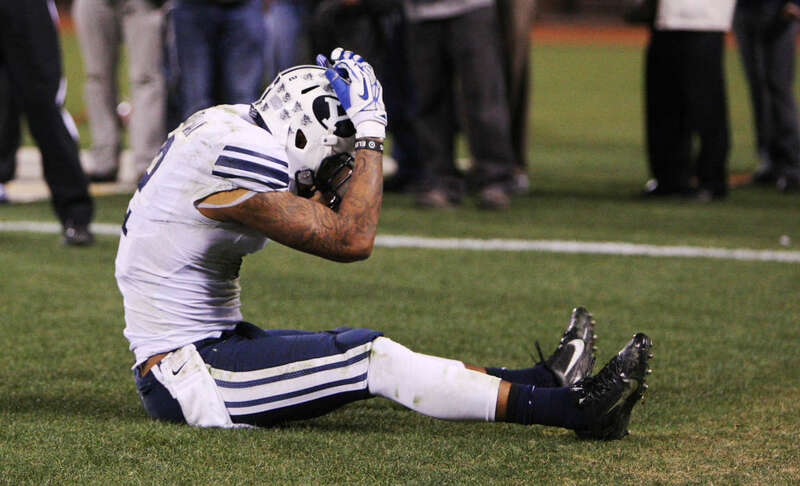 As disappointed as I am, I am definitely not a fair-weather fan, so I will continue to support the Cougars and hope things turn around in 2014. Here are a few things I think the football and basketball teams need to do to improve. Time for tough love . . .
1. Go a little less fast, a little less hard. BYU football had one of the fastest offenses in the country this year, snapping the ball to Taysom 684 times. While I think it was an interesting approach for Anae to use, and I guess it was worth a shot, it just didn't work. We need to go for quality instead of quantity. Playing smart is a lot more important than playing fast. Take the time needed to call good plays-- stop rushing it! 2. MAKE FREE THROWS. With the exception of Tyler Haws, who is still fairly reliable, I swear I have a higher free throw percentage than most of the BYU basketball team this year . . . sheesh. It's killed their ability to stay in the game more than once. It just doesn't look like they're taking things seriously, and they're letting the pressure get to them. I don't care what it takes-- If they have to do it again and again and again until they understand, so be it. They need to learn to get that ball in the hoop from the charity stripe. I get angry when they get fouled because it just means points that could have been . . . and that's not the way it should be. 3. Throw out the offensive line and start over . . . again. Taysom carried way too much of a burden this year, and he took a real beating. He is super lucky that he made it through the whole season without a serious injury. He got sacked 38 times-- that's ridiculous. I think it's time to roll out the 3rd brand new offensive line in 3 years. They've gotta try something else because this just isn't working. 4. Bench Carlino. Sorry, I just can't handle his poor decision-making ability anymore. Put Kyle at the point, and sub in Halford, who can actually hit a 3 once in awhile. Matty also plays better when he has something to fight for-- if Rose takes him out of the starting lineup, I think he will play with his head on a little straighter. But he can't give him the starting job back easily-- he's got to really earn it. 5. Play to strengths. This could easily apply to both teams-- put the ball in the hands of the players who can do the best things with it. I think the rushing game is pretty solid next year in football, with Jamaal Williams, Adam Hine, and Paul Lasike, not to mention Taysom himself. The receivers will struggle, though, especially with the loss of Cody Hoffman, Skyler Ridley, and JD Falslev. If that means they need to run the ball more than throw it, so be it. They have to do what works. In basketball, the ball needs to be in the hands of Tyler Haws, Kyle Collinsworth, Skyler Halford, and Eric Mika. They get points. On the other hand, Nate Austin should almost never shoot the ball-- his role is solely rebounding and blocking. Unless the shot clock is gone, they should always be looking for a good shot-- not throwing up ridiculous prayers. We don't need heroes-- we need teammates. 6. Make the best of what they've got. Resist the temptation to panic! 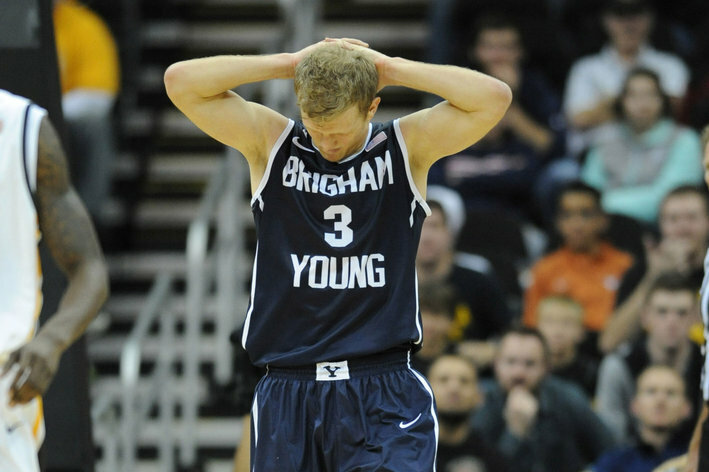 It's not looking like a deep run in the NCAA is in the BYU basketball team's near future. In fact, at this rate, they'll be lucky to make the NIT again. But now is not the time to throw in the towel-- take things one day at a time and don't let the emotion get you. Mika especially needs to control his temper and stop committing stupid fouls and getting technicals on top of it. They can still have a successful season if they start working RIGHT NOW. The football team's schedule is a lot easier next year, but that doesn't meant they can take a nap. They need to get their heads on straight and play hard, and they could come out with a 10-win season, prepping them adequately for another tough year in 2015. Fingers crossed that 2014 sees more success on the court and the field!